Truly a shame that the opposition has resorted to such a tactic. Here are the Executive Director Katherine Craven's own words from the meeting with Longmeadow residents on May 18th 2010. Question: "CAN YOU CONFIRM THAT A LETTER WAS SENT FROM THE MSBA TO THE LONGMEADOW SCHOOL BUILDING COMMITTEE IN NOVEMBER 2009 ASKING THAT THE SCHOOL BUILDING COMMITTEE RESUBMIT THEIR PROPOSAL WITH ADDITIONAL INFORMATION REGARDING BUILDING RENOVATION?" Answer: Yes, When we first looked at the initial-this is not unusual either-as I said before, our general impulse is to renovate when we can-because we have less surprises potentially about the building SITE in a lost of places. We needed clarification on the renovation costs-we thought it was very high when it first came into us and then we realized the level of effort that was required in a renovation including that all of the structures within the building would have to be completely gutted. We thought that the unit costs for the foundation seem a little high. We'd gone back and forth with the Town and their professionals on all of these minute details--and that's NOT AN UNUSUAL thing for us because before I would make any recommendations to Treasurer Cahill and the Board of the MSBA, I want to make sure that we had all the answers on the costing. There were several things , as I mentioned before MULTIPLE TIMES, that convinced us that the new school building was probably the more COST EFFECTIVE SOLUTION for Longmeadow High School's problems. The structural problem in the front, ADA in the building, the subterranean sort of utilities and issues--those things would have had to be pulled out. 4.5 years of phased renovation vs 2.25 years of new building phasing. Those are ALL VERY COMPELLING reasons that we thought that the new building scenario that was presented to us--after hearing the CLARIFICATIONS on the reno REALLY MADE SENSE TO US. Question: "WHAT ROLE DID CONGRESSMAN NEAL, STATE SENATOR CANDARAS, AND STATE REP ASHE PLAY REGARDING THE LONGMEADOW SCHOOL BUILDING COMMITTEE DISCUSSIONS WITH THE MSBA DID THESE OFFICIALS IN ANY WAY INTERACT WITH THE MSBA ON BEHALF OF THE LONGMEADOW SBC, AND IF SO IN WHAT CAPACITY AND TO WHAT OUTCOME?" Answer: I talked to Sen Candaras and Rep Ashe all the time as part of my job, We're an agency that has to do annual reports to the legislature. We have a lot of sets of eyes watching how we spend your money. The time that any legislator could actually affect any decision by the Authority is whether or not to put you in the pipeline to begin with. There are plenty of districts just waiting to get to the position that Longmeadow is in right now. There are probably ONLY 70 DISTRICTS that are in the pipeline to the extent that Longmeadow is and I can point out to you that it is BECAUSE of the STRUCTURAL PROBLEMS that I can't point to any other district buildings that aren't in the pipeline for 34MILLION right now. The whole question of whether a congressman, rep or senator or even GOD could influence this project could only have occurred prior to you getting into the pipeline. LUCKILY YOUR CONDITIONS WERE SO BAD THAT WE TOOK YOU ALMOST RIGHT AWAY--after a 4 year moratorium. You have every right to question us for our veracity, credibility, track record but I'm happy to say that we actually have a good track record of doing what we say. We wouldn't be here today if we did not follow through--and we have the money for you set aside. We tried to set up something that is SO ABOVE BOARD AND CREDIBLE that is outside the usual process and that's what the legislature basically said to do. " Ms. Craven spent a significant amout of time answering questions from Mr. Moran, Mr Occhuiti, Mr. Nolet and Mr. Wojik. In fact, Mr. Nolet asked Ms. Craven to send us MORE money! She answered all of their questions completely and truthfully. Mr. Moran's last minute attack on the process and the integrity of the School Building Committee is his last shot of bolstering his candidate's support. Sad that Mr. Moran and the members of A Better Longmeadow have to resort to dirty politics to try and spread fear and doubt when this process has been completely tranparent! This morning I took some time to visit Storrs Library to read the letters dated November 3, November 10 and November 19, 2009 sent by the MSBA/ Katherine Craven’s office to the Longmeadow School Superintendent Jahn Hart. What I read in these letters made me very angry. Angry because our School Building Committee- co-chaired by Christine Swanson (elected School Committee member) and Robert Barkett (elected Select Board Chair) failed to share the contents of these letters publicly. It is interesting to note that Ms. Hart was quoted by CBS-Springfield as saying, “these documents had been public ever since they were written in November”. However, they appeared only this morning for public review because they were obtained through the efforts of Roger Wojcik and his group using the Freedom of Information Act to gain access. I personally developed and maintained the School Building Committee’s (SBC) website at no cost to the town since the summer of 2009 and it has provided town residents with a wealth of information about the project. There is not much about the high school building project that cannot be found on the SBC website (except these letters). it is very clear that the MSBA in early November wanted Longmeadow to reconsider the renovation option (with different assumptions) with the potential outcome being a much lower cost alternate to the project that will voted on June 8. As many of you know who follow the LongmeadowBuzz blog, I have been actively engaged in the school building project and debate having attended most of the public forums including the most recent forum with Katherine Craven. I have also frequently posted articles about property tax information related to the project and more clearly explained “average” property tax increase to town residents including my most recent post entitled School Building Cost and Taxpayer Information (4/16/10). After the SBC decision on September 30 to select option 2B (new + renovation) until late November, there was a “quiet period” during which there was very little information shared with town residents about the SBC activities. Meeting minutes for the SBC were not posted on the website from June to late November . The committee had also not met their legal obligations to file minutes with the Longmeadow Town Clerk in a timely manner. In late November I requested that the School Building Committee send me the missing meeting minutes to help people understand what was going on. Gradually these meeting minutes appeared. It is interesting that the 11/05/09 SBC meeting minutes mentioned the MSBA letter + SBC response but did not reveal any details. The 11/19/09 SBC meeting minutes were not received for posting until February 10. These 11/19/09 minutes do share some insight into the role of our local politicians in getting the project approved at the MSBA Board Meeting on 11/18/09. Back in October I wrote a Buzz article called “Now is the right time!” (10/04/09) in which I urged support for the new school project because I listened and believed all of the information that was being shared with the public by the Longmeadow SBC. I felt that this was the right decision. Now I feel that I was deceived by the same committee that I was helping. As the School Committee and Select Board became engaged in a difficult FY2011 budget process, I became very concerned that Longmeadow could not afford the $78 million new + renovated school project and still be able to maintain the other services and employees that makes Longmeadow a great place to live. With other capital improvements as well as rapidly rising operating costs on the horizon, a cost effective solution for the high school was clearly needed. It now looks like the game plan from the start was to build new and not seriously consider renovation of the existing building. I would like to hear from our elected officials who knew what was going on with the MSBA in November but decided not to share the information with town residents. Take a look at the distribution for these letters to find out who received copies. This is not transparency in government. WE NEED ELECTED OFFICIALS WHO WILL BE OPEN AND HONEST AND WHO WE CAN TRUST. I would urge town voters to consider rejecting the High School Project and vote NO! Below is a LCTV video of the recent School Committee Candidates Debate taped on May 28. This is a good opportunity to learn more about the three candidates running for the two SC openings on Election Day next Tuesday, June 8. In case you were wondering about the flurry of papers that fell out of your Reminder this week, one of them is from the Citizens for a Responsible Government. This organization has been opposed to much progress in the town's history, and I was pleased to see that Mark Barowsky, Chair of the Longmeadow Finance Committee, responded to what he called the "published propoganda" via a note to the School Building Committee (SBC) with many points of clarification and correction. Of course, the SBC knows the truth, so he is preaching to the choir. I post much of his letter here as a way of reaching out to a wider audience of interested readers. All emphasis via bold/italics is mine. "A flyer inserted in this week's reminder by the CITIZENS FOR A RESPONSIBLE GOVERNMENT made erroneous statements as to the position and [recommendation] of the Finance Committee presented at the Special Town meeting on May 11th. "The Finance Committee's recommendation was that the project is 'financially feasible' not 'feasible'"
"The Finance Committee at no time stated that taxes will double by the year 2020 if only this project was approved"
"The Finance Committee's calculation for the rise in taxes through 2020 NEVER included a negotiated contractual escalation of 4.5% for labor costs"
In all seriousness, lots of things can be considered, but few are within the realm of possibility. What does Mr. Barowsky say about them? "The Finance Committee has noted that while there have been many studies performed that there has been no prioritization for any of the projects and while there is a recognized need, it has yet been determined if any of these projects need to be on an immediate basis. The Finance Committee has recommended that the boards prioritize and put a plan in place as to which and when each project should be initiated." "Unless the statement was made behind closed doors, the comment that 'several of the Finance Committee members repeatedly insisted that property owners could always choose not to pay the taxes' was never made in our meetings. Such an aberration can only be deemed a deception." "This Citizens for a Responsible Government seem to use such information as a drunken man uses lamp posts - for support rather than for illumination." I don't know about that, but I do know that the focus on any town vote should be based on the facts, on the legitimate merits of a case. The facts of the LHS are clear--clearly disturbing. The need for action has been established. The proposed plan meets those needs and addresses the concerns about maintenance and cost effectiveness. The proposal we will vote on JUNE 8th at the Community House from 8am to 8pm is a financially feasible proposal. The whole town will benefit if the vote is a gracious YES, thank you. As a member of the Finance Committee, whose responsibility it is to conduct long range fiscal planning, we have reviewed a number of 10 year scenarios. When you scenario plan, you assume both good and bad. That leads to “what ifs”, uncertainty and outright guesses. I admit that I don’t have the powers to foresee the next 10 years and these days, it’s hard to predict what may happen 6 months from now. But what I can tell you today, at this moment, is that our Town has very little long term debt and can afford the LHS project before you, our residents on June 8. I don’t have to remind you that our town’s financial Achilles heel is that our tax base is limited by its residential nature and the restrictions of Proposition 2 1/2. There simply is very little extra revenue to fund these major capitol projects while trying to maintain the level of day to day services that we now enjoy. We have to find, and if deemed proper, embrace any opportunity that allows us to one by one, rebuild our worn out infrastructure. One of these opportunities is upon us. For nearly thirteen years, we have been trying to get to this point today, where a viable option finally exists to fix our High School. Over the last 22 months, the Longmeadow School Building Committee (SBC) of which I am also a member, has worked to position our project within the guidelines of the MSBA, knowing full well that we had one shot to take advantage of the current reimbursement program. The alternative: Lose the approved 34 million dollar grant and literally start over competing with 100’s of other school districts already vying for the same dollars. Again, looking at this moment in time, losing that money would be in my opinion, financially irresponsible. Thousands of hours have gone into the design of the high school submitted to and approved by the MSBA for funding. It keeps us competitive with other bedroom communities in providing a high school facility that can legitimately reach a 50-year life cycle. It will allow our teachers today and tomorrow to fully take advantage of 21st century learning initiatives and it provides key academic and community spaces that our current footprint under any renovation plan would be difficult to match. Surrounding communities have recently supported investing in new high school projects while facing similar economic constraints as Longmeadow. I hope that as a community, we seek to understand every dimension of this decision, encompassing both current residents and future generations. Though it is difficult to separate today’s seemingly uphill battle from the hope and promise of a better tomorrow, I believe the residents of Longmeadow will ultimately make the right decision. In the 50’s my grandparents made that decision by voting for the construction of our current high school facility. I honor their memory and their foresight to keep excellence in the delivery of Longmeadow’s public education, by suggesting that we do the right thing for our children and grandchildren, and vote yes for this project. The following are excerpts from the Select Board Candidate Debate held on May 18, 2010 and sponsored by The Longmeadow Youth Sports Council. Production of the video was provided by Phillip Steiger and his efforts are gratefully acknowledged. What experience do the four candidates running for the two Select Board openings have in financial services and the budget setting arena? After listening to the candidate answers to this important question, it is pretty clear that one candidate in particular lacks the needed skills and experience to effectively manage a $50 million budget and make difficult and complex decisions facing our town. While I applaud Mr. Clark's initiative to step up and become involved in town government, our town cannot afford to elect someone to the Select Board at this critical time who is likely to be doing a lot of "on the job training" and resume building. 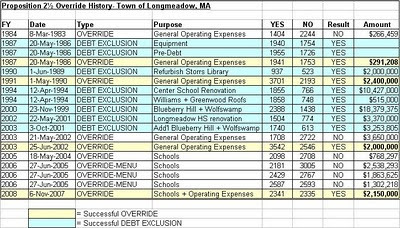 A look back at the history of Proposition 2½ overrides (both operational and debt exclusion) in the town of Longmeadow showed the following results. There have been 5 successful Prop. 2½ debt exclusion overrides (for school capital improvement projects) during the past 16 years for a total of $35.7 million. None were rejected. There have been 3 successful Prop. 2½ operational overrides during the past 20 years averaging $2.2 million or 1 every 6-7 years. There were 3 unsuccessful overrides during this same time period. The last successful Prop. 2½ override in November 2007 passed by a margin of 6 votes! The debt exclusion override for the Longmeadow High School project that will decided on June 8 is for $44.1 million which is equivalent to an operational override of ~$3.2 million. It is very likely we will need an operational override in FY2013 (if not next year) to pay for rapidly escalating costs and a new teachers contract (FY2013) at the same time that the property tax increase for the new high school takes effect. Longmeadow's spotty record (50/50) in supporting operational overrides provides an uncertain future for our town. Given that town employee salaries + benefits represent a very large percentage (> 75%) of the town’s budget, the primary means to reduce spending is to layoff town employees (including teachers) and/or continue with the 0% COLA scenario for the foreseeable future. Neither one is very appealing. If we lose many of our quality teachers due to layoffs or non-competitive salaries but have a new $78 million school, Longmeadow will be a “big time” net loser. Other cuts such as those that were being considered for the FY2011 budget including reduction of Storrs Library services and hours, Park and Rec programs, etc…. will need to be reconsidered in order to achieve reduced spending. At the May 25 Special Town Meeting, current Select Board member Paul Santaniello expressed his support for the new high school project with the caveat that "it's just the beginning". He emphasized that Longmeadow has other significant infrastructure capital needs including a DPW facility, water/ sewer, renovation of Glenbrook/ Williams Middle Schools.... and town taxpayers will need to support them as well. I am very concerned that there may be a dismal future for Longmeadow unless Longmeadow taxpayers are willing to allow taxes to increase considerably more than what Proposition 2-1/2 allows.